When I read that rhythm was the topic of the January quilt, my first inclination was to do something related to music, my academic area of expertise. As I thought about the topic I decided to challenge myself to look at other types of rhythms, such as life cycles, calendar cycles, and those found in nature. I chose to create a quilt which depicts the rhythms found in nature. Each spring, leaves start to bud, then they often darken as they get older before turning beautiful shades of orange, gold and brown, before falling off the tree and turning dark brown. The next year the cycle repeats. Some will be blown off the tree prematurely, while others will fall gracefully to the ground at the end of autumn. The quilt uses a Sky Dye painted background that was gifted to me by the husband of a quilting friend who died. I have waited years to have the courage to cut into the beautiful piece of fabric, but it was the perfect background for the leaves. 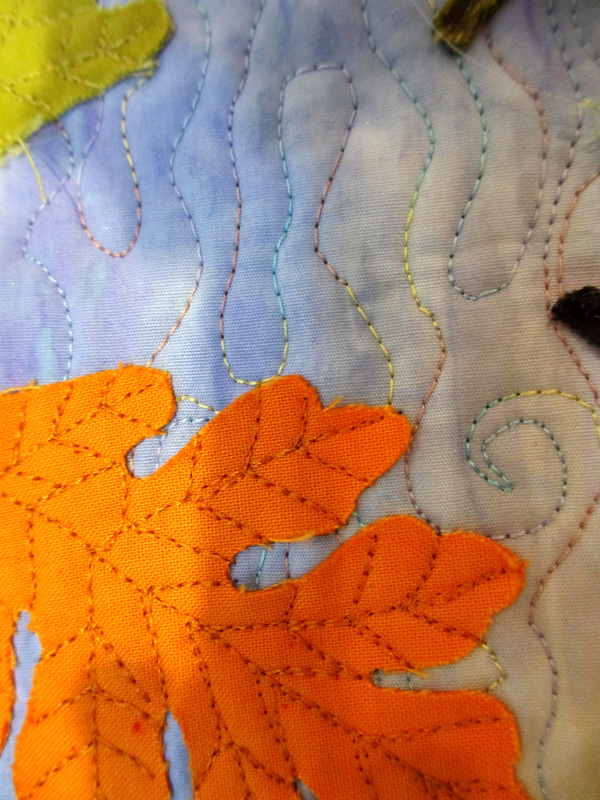 The background was quilted with Tire silk variegated thread. 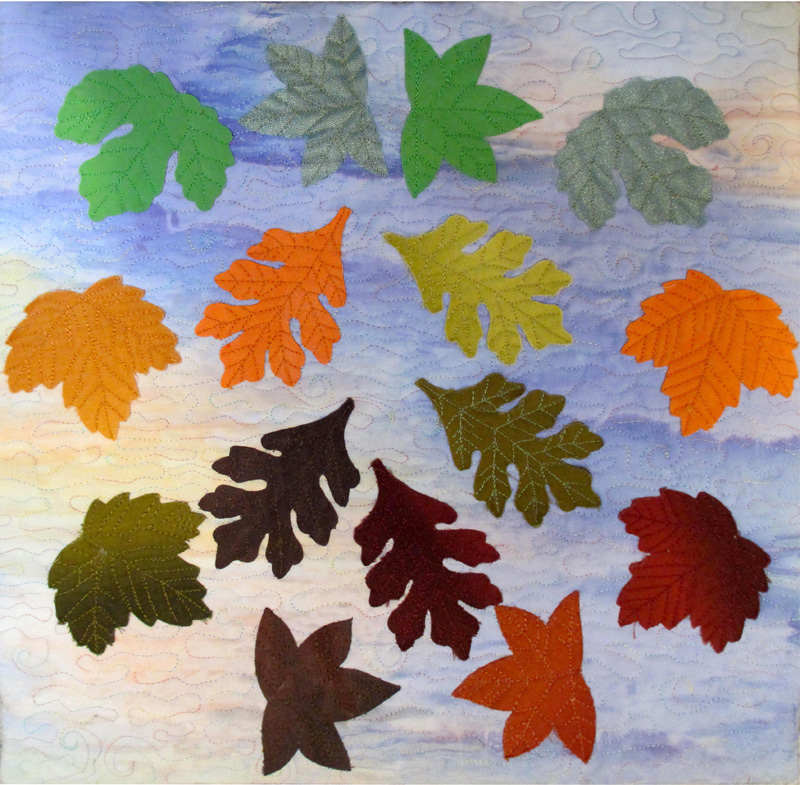 The leaves are double sided and were sewn onto the background using free motion stitching, so that the edges remain detached. The technique is based on one taught by Ferret at the International Quilt Festival Houston. 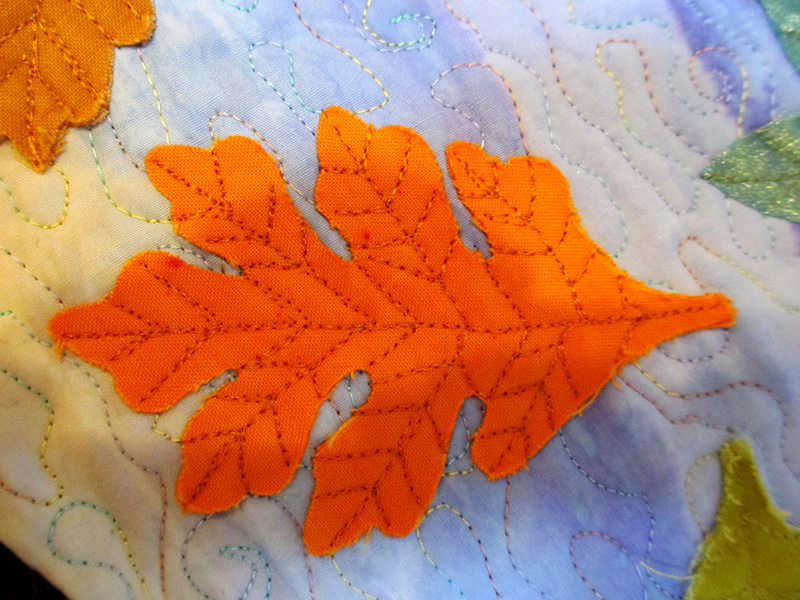 I chose to face the quilt rather than bind it, to enhance the movement of the leaves. Thank you for the positive comments on the leaves and background fabric.